Update: 12-08-2009 This stocking sold out for 2009 season, we will be bringing a similar stocking to our stock in October 2010! This is a stocking we have made for us in Europe from the finest European Velvet and short Plush on the cuff. This is the darkest deepest color velvet we have seen. It is dark burgundy that looks almost black - depends on the lighting in the room, The top is made of short plush or gold velvet (see option pictures lower on this page for details) to create luxury classy look. Check out the group pictures that present our stocking in a group with other velvet material stockings we carry so you can appreciate the deep velvet coloring of this one. We have it available in Dark Burgundy Velvet and Dark Green Color Choice. 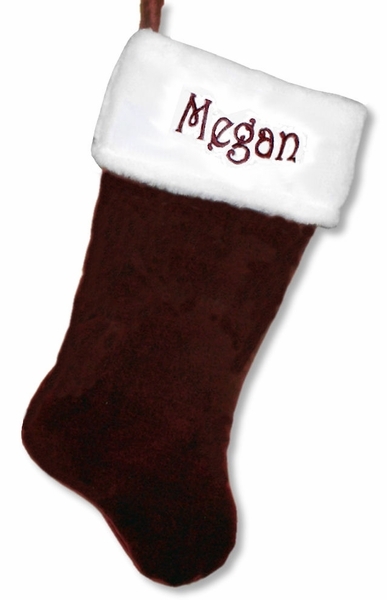 The stocking has lining so it feels soft and smooth to the touch and displays very nicely. Measured along the diagonal from the top left hand corner to the toe, the stocking measures 17 inches, and the width of the cuff is 8 inches.